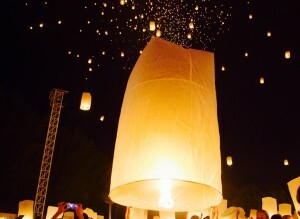 A few weeks ago I traveled to Chiang Mai to celebrate the Thai New Year, Loi Krathong. For a few years now this is an event I have dreamed of going to and the fact that I got to go and experience it has taken a few weeks to process. As a photographer, you can not imagine anything more thrilling than thousands of people packed into a university field releasing thousands of lanterns. As a person, gathering with thousands of other strangers to celebrate and join together for something as magical as this was life changing. Loi Krathong/Yi Peng is a celebration of the Thai New Year. Every year the entire country celebrates by releasing lanterns called "lanna" into the sky and floating krathongs into the water. 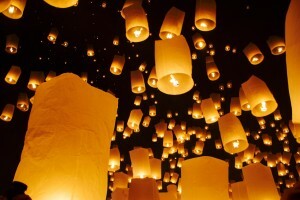 The sky lights up with lanterns and the rivers and lakes are illuminated by the floating krathongs. There is nothing else like it in the world. 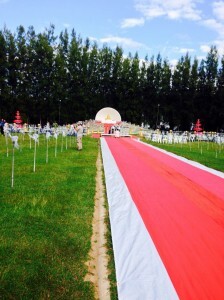 I left Chiang Mai four hours before the event was supposed to begin. New Year's celebrations take place all over Thailand, but, every year there is a huge gathering at the Mae Jo University in Chiang Mai. 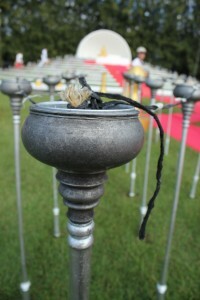 If you Google "Loi Krathong/Yi Peng" a lot of pictures that come up are from the event at the university. I wanted a great place to sit and be able to take pictures, so I left earlier than most people. Maybe, if I were really lucky, I would find a place that would not get too crowded. I was lucky with the place I got. 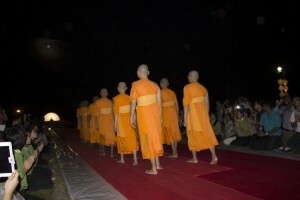 I ended up next to the red carpet where the monks would walk right past me! I set up camp and got ready to sit in the blazing sun for the next few hours. I had a lot of fun people-watching and going through a roller coaster of emotions about how excited I was that this day was finally here. Before I knew it, it was time! It was getting dark and there were SO MANY PEOPLE. I was SO EXCITED! I got my camera ready and for the next two hours I felt like I was on another planet. Imagine almost 10,000 people all packed together in a small space, and then all of a sudden it gets quiet - really, really quiet. You cannot even hear people breathing. 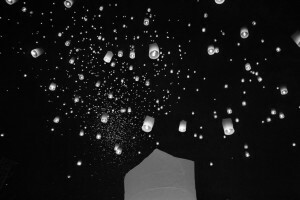 That is what it was like the second the thousands of lanterns took off into the night sky. Then came the joy-filled gasps. If you have ever seen the movie "Tangled" then you know the lantern scene in the movie - it was literally like I was in a Disney movie that night. I was so taken by the magic of the night that what happened next did not even bother me very much. It took two hours to walk what had taken five minutes earlier that day because so many people were trying to leave the university at the same time. Nothing could take away the magic that night. Every day is full of adventures and more challenges than I have ever faced before. If you ever have a chance to do something new and terrifying, please take it. I can write the words and show you the pictures, but experiencing it firsthand is indescribable.